Quail eggs weigh in on average at just 12 grams (compared to around 60g for a hens egg). They are enjoyed by most hard-boiled in salads and are eaten in a small mouthful. If you enjoy quail’s eggs then you might be tempted to keep a few quail to be able to produce your own fresh eggs. In the U.K, quail’s eggs are a speciality and although they are available on supermarket shelves, the price of them demonstrates that they are only produced and sold in very small numbers compared to the ever-popular chickens’ egg. The cost of producing quail eggs is in fact very reasonable, so you should be able to produce them cheaper than you can buy them from the supermarket. Quails eggs also make a great gift, but try to find out if they are liked first because not everyone will eat them, even though their taste is the same as a chicken’s egg. If you are thinking of selling quail eggs, there is strangely no legislation in the U.K although it might be a good idea to check with your local trading standards office if you intend to sell them. If you have a glut of quail eggs, they can be pickled and enjoyed at a later date. There is a recipe for pickled quail eggs here that we use. Quail start to lay at around eight weeks of age. The Coturnix (sometimes called the Japanese quail shown right) is the most popular and the most productive. In the wild, they lay two or three clutches of about a dozen eggs each per year although in captivity, without any special selection, they can lay over 230 eggs or more if there is sufficient lighting. Some have been recorded laying 300 eggs in a year which puts most chickens to shame! To keep quail laying into the winter so that you continue to get eggs, they will need artificial lighting. They require 14-16 hours of light each day which should be provided using a timer. It is better to top up light levels in the morning so they aren’t suddenly plunged into darkness at night as the timer switches off. There is more information on artificial lighting for chickens here, which applies the same principles as you need for quails. Unless you intend to breed from your quail or require fertile hatching eggs to sell, there is no need to keep males. 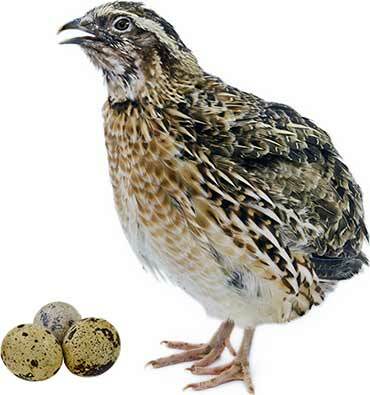 A separate article on breeding quail covers the breeding process and the fertility of quails eggs which can be a lot more sporadic than chickens and other poultry.